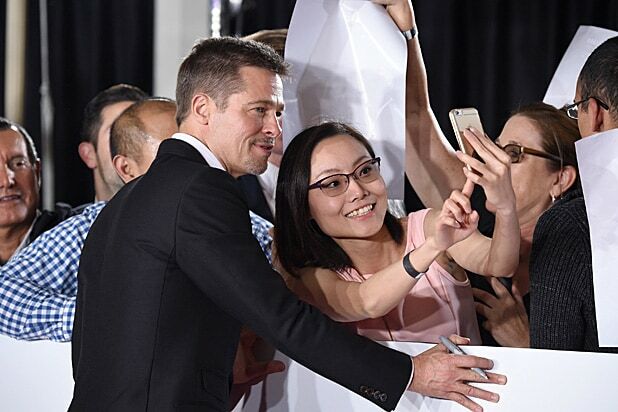 Brad Pitt was ever the professional when he returned to the red carpet for the first time since splitting from Angelina Jolie. The 52-year-old actor appeared with co-star Marion Cotillard for the Hollywood premiere of “Allied” at the Regency Village Theatre in Los Angeles on Wednesday night. Aside from the obligatory professional pics for the photo pool, Pitt posed for selfies with besotted admirers lined up along the streets at Paramount’s fan event. In Robert Zemeckis‘ World War II romance, Pitt and French actress Cotillard play two government operatives who take down some Nazis before settling in a turbulent Britain to get married and raise a family. As the war churns on, however, their idyllic home is torn when a ranking commander (“Mad Men” alum Jared Harris) informs Pitt that Cotillard may be a German spy. He has 72 hours to prove his beloved’s innocence, or kill her personally to prove his allegiance to the cause. Earlier on Wednesday, Pitt was cleared in the child abuse investigation that was at the center of his divorce from Jolie. 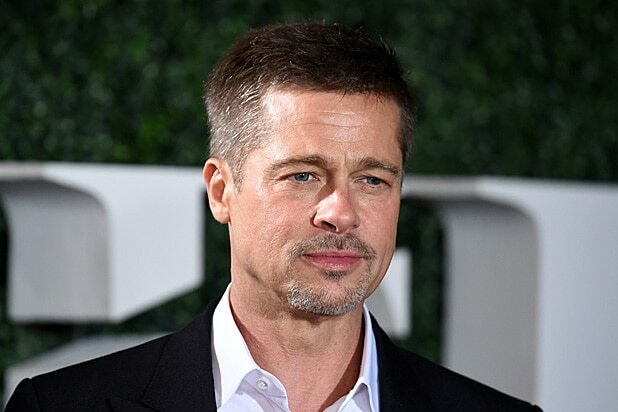 The L.A. County Department of Children and Family Services concluded its investigation into an alleged incident between Pitt and their son Maddox, finding that the actor had not harmed the child, per TMZ. Pitt and Jolie reached a settlement in their divorce case earlier this week. Jolie, who filed for divorce in September, will continue to have sole custody of the six children with Pitt in a joint agreement reached by the actors, according to her representative. Maddox Jolie-Pitt, 15, Pax Jolie-Pitt, 12, Zahara Jolie-Pitt, 11, Shiloh Jolie-Pitt, 10, and twins Knox Jolie-Pitt and Vivienne Jolie-Pitt, 8, will have “therapeutic visits” with their father under the terms of the deal. The “World War Z” actor made his first public appearance since Jolie filed for divorce on Monday for a private screening of “Moonlight,” alongside former costar Julia Roberts. His production company, Plan B, partnered with A24 to produce the drama about a gay, African-American boy that is an awards season favorite. See Facebook Live footage from the “Allied” fan event below. Brad Pitt and Angelina Jolie are calling it quits 12 years after their relationship began with a meetup that drove Hollywood gossip magazines crazy. The two met while filming the spy romance "Mr. and Mrs. Smith" and fell in love while Pitt was still married to Jennifer Aniston. They are far from the first Hollywood couple to fall in love on set, but not every couple met the same ending. Humphrey Bogart and Lauren Bacall became one of the most famous couples of Hollywood's Golden Era after they met in Bacall's debut film, "To Have and Have Not." The two married in 1945 and starred together in three noir films: "The Big Sleep," "Dark Passage" and "Key Largo." They remained together until Bogart's death in 1957. Another Golden Era relationship that didn't pan out so well was Ronald Reagan and Jane Wyman, who fell in love on the set of "Brother Rat" in 1938. The two were married from 1940-1948, but broke up after the stress of their acting careers and Reagan's job as president of the Screen Actors Guild put a strain on their relationship. Still, the two remained on good terms even as Reagan went on to become the only divorced U.S. president in history. Scandal erupted on the set of the historical epic "Cleopatra" in 1963 thanks to its principle actors, Richard Burton and Elizabeth Taylor. Though the two were married to other people, they began an affair while playing Cleopatra and Marc Antony in the film. The two entered a turbulent marriage, during which they starred together in "Who's Afraid of Virginia Woolf?" Burton and Taylor divorced in 1975, remarried in '75, and then divorced again in '76. Another famous affair was the one between Spencer Tracy and Katherine Hepburn, who starred together in "Woman of the Year." Unlike Burton and Taylor's very public affair, Tracy and Hepburn kept theirs very private, with Tracy keeping it secret from his wife, whom he never divorced. Hepburn also did not speak publicly about her relationship with Tracy until his wife's death in 1983. On the other hand, there's Paul Newman and Joanne Woodward, who fell in love in 1957 while filming "The Long, Hot Summer." They married a year later, had three daughters, and stayed together until Newman's death in 2008. While Susan Sarandon and Kevin Costner's characters ended up together in "Bull Durham," Sarandon ended up with co-star Tim Robbins in real life. While they never married, they had two sons and stayed together from 1988 to 2009. Kim Basinger and Alec Baldwin had one of the more contentious breakups in modern Hollywood. They met in 1990 on the set of the rom-com "The Marrying Man" and wed for real three years later. They separated in 2000 and officially divorced in 2002, sparking a four-year long custody battle over their daughter, Ireland. Tom Cruise and Nicole Kidman met in 1990 on the set of the NASCAR drama "Days of Thunder" and got married that same year. They later appeared together in the Stanley Kubrick film "Eyes Wide Shut" and divorced in 2001. When Matt Damon burst into the film world with his iconic performance in "Good Will Hunting" he also started dating his co-star, Minnie Driver. Their relationship was short and not-so-sweet, ending when Damon publicly said he was no longer with Driver during an interview on "Oprah." Driver had no idea Damon was going to make the announcement and later described Damon's move to the L.A. Times as "fantastically inappropriate." Things went better for Sarah Michelle Gellar and Freddie Prinze, Jr., two late-'90s teen heartthrobs who met while filming "I Know What You Did Last Summer." They began dating in 2000 and married two years later. Today, they are still together and are raising two kids. While all the pairings here have been between actors, there's one actor/director couple that became a potent creative duo in recent years. After meeting while working on the 2001 "Planet of the Apes" remake, Tim Burton and Helena Bonham Carter entered a 13-year relationship during which they worked together on multiple films. Their collaborations include "Big Fish," "Corpse Bride," "Sweeney Todd" and "Alice In Wonderland." The two "separated amicably" in 2014.